8 December 2014, Lima, Peru. 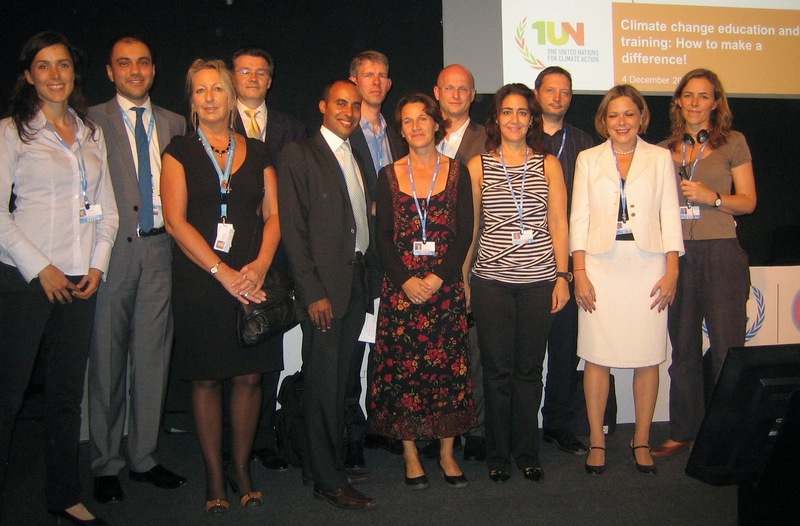 An unusual side event at the annual Climate Conference in Lima (COP 20) provided a snapshot of what the United Nations is doing to support climate change education and training for children, youth and adults. Panellists and participants discussed how learning can actually ‘make a difference’ on the ground as well as the role of formal, non-formal and informal approaches. The audience also actively engaged in a game on climate risk management animated by the Red Cross Red Crescent Climate Centre (RCCC). The event was hosted by UNEP, UNITAR, UNESCO, UNICEF, FAO, and IFAD in collaboration with YOUNGO. It was moderated by Mr. Daniel Abreu, National UN CC:Learn Focal Point at the National Climate Change Council (CNCCMDL) of the Dominican Republic. In his welcome remarks, Mr. Angus Mackay, Manager at UNITAR’s Climate Change Programme pointed out that funding and programmes on sustainability issues is at an ‘all time high’ and that especially young people have never been so aware of sustainability issues. “However, actual behaviour change is not following automatically. We need to make sure that programmes actually lead to measurable results, including effective monitoring and evaluation,” he said, referring to a recent publication by FAO (“Making It Count: Increasing the Impact of Climate Change and Food Security Education Programmes”). The event featured three case examples illustrating UN projects and programmes for different age groups: beginning with climate change education for children; to empowering youth to take action on climate change; to professional training for adults. Ms. Mariana Alcalay, Education Project Officer at the UNESCO Office in Brazil introduced a pilot project for training teachers on climate change education for sustainable development in the State of Santa Catarina. Ms. Alcalay highlighted that as a result of the programme children are not only showing keen interest in climate change related issues, but are also taking the message out to their communities. Mr. Brighton Kaoma from Zambia, who connected via Skype, talked about a youth movement that has been inspired by the UNICEF-supported Unite4Climate programme. Mr. Kaoma underlined that “Unite4Climate aims to inspire the leadership aspect that’s embedded in every young person.” In Zambia alone, over 1,000 youth have been trained on locally relevant solutions to address climate change and environmental problems. The highlight of the event was a climate risk management game that involved the entire audience in an active exercise on decision-making under time pressure. Participants were asked to split up in groups and decide on whether to invest in flood protection or not. A die was thrown to determine whether a flood happened (number 6) or not (numbers 1-5). “To illustrate the effect of climate change, we change to a different die with higher probabilities of throwing a six, meaning a flood,” Mr. Maarten Van Aalst, Director of the RCCC, explained. “We have played this game in various settings, including the White House. For the IPCC authors we asked them to use their own report to inform their decision-making. Made them think quite a bit…”, Mr. Van Aalst jokingly said.